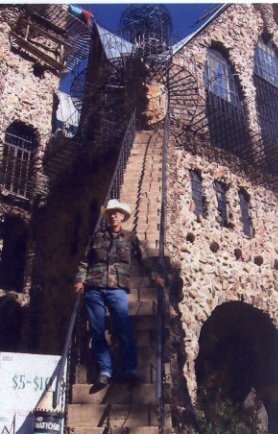 Sorry to correct you, but it's James or Jim Bishop but all his friends just call him "The Castle Builder" and Andretta's Tower is about 160 feet tall. Hope you can return to the Castle soon. Your Castle Friend, Keven." Please post any corrections, updates, or comments you have about this photograph, the people in it, or the time it was made here.